Birds sing from the heart. While other four-limbed animals like mammals and reptiles make sounds with voiceboxes in their throats, birds' chirps originate in a unique vocal organ called the syrinx, located in their chests. No other animals have a syrinx, and scientists aren't sure how or when it evolved. In a new study in the Proceedings of the National Academy of Science, an interdisciplinary team of developmental biologists, evolutionary morphologists, and physiologists examined the windpipes of birds, crocodiles, salamanders, mice, and cats to learn more about how syrinxes evolved. Their findings seem to confirm: the syrinx is an evolutionary odd duck. But it might have arisen from a reinforcement at the bottom of the windpipe that we still see in many other animals. 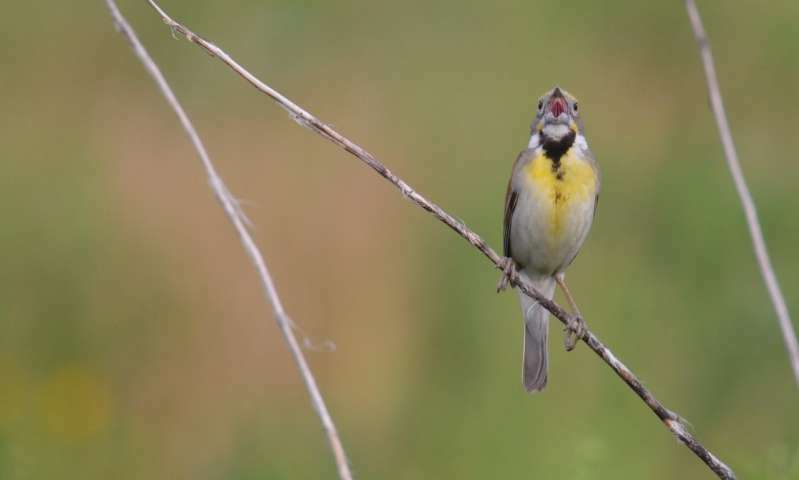 "Birds have a unique organ in their airway to produce sounds—it's like a flute," says Chad Eliason, a postdoctoral researcher at Chicago's Field Museum and co-first author of the study. 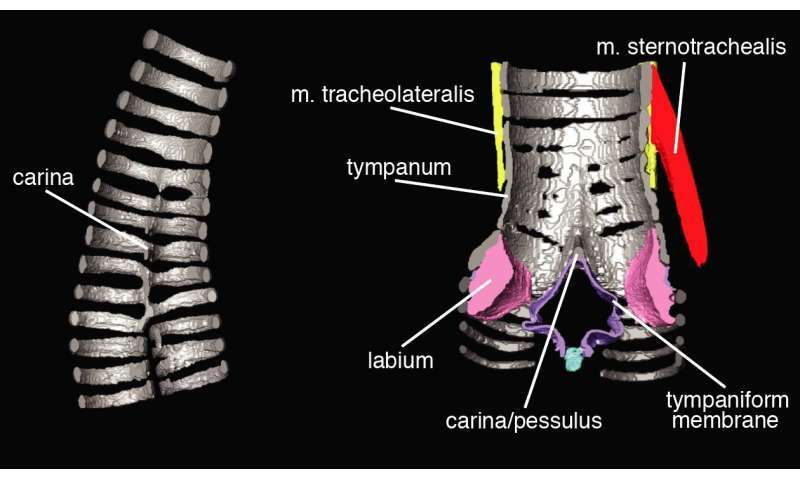 "We don't know where that organ came from, how and why it evolved. But in this study, when we zoomed out and looked at the windpipes of other animals, we found deep similarities that we didn't expect." Mammals, birds, and reptiles all have a trachea—a tube connecting the nose and mouth to the lungs. And we all have a larynx—a hollow, muscular organ at the top of that tube that helps air pass through to the lungs and keeps food from falling into the airway. In mammals and reptiles, the larynx has little folds of tissue that vibrate when air passes over them, producing sound. In birds, the larynx can't produce sound—it's only there for breathing and eating. Instead, birds' sounds are produced at the bottom of the trachea, just above where the trachea branches into the lungs. This juncture, made of cartilage, is the syrinx. "The syrinx is a tiny box of cartilage—in a sparrow, it's about 8 millimeters in diameter, about four times the thickness of a strand of spaghetti," says Eliason. "It reinforces the airway, and when air passes over the folds in it, it produces a sound: birdsong." Eliason and his fellow scientists, including co-first author Evan Kingsley of Harvard Medical School, examined the tracheas of a suite of animals. Cats, mice, and crocs all have a set of fused cartilage rings at the base of the trachea, called the carina, that provides structural support where the trachea branches to the lungs—just like a syrinx does. "Perhaps the syrinx is just a byproduct of reinforcing the airway, like a carina does in other animals," says Eliason. The existence of structures like the syrinx and the carina aren't new to science—people have known about them for decades. But this study provides a new way of looking at them. "We're deepening our understanding of how these structures are related to each other, and that could help us understand how the syrinx evolved in the first place," says Julia Clarke, professor at University of Texas at Austin and a leading author of the study. Two primary hypotheses for the evolutionary transition from a laryngeal sound source to a syringeal sound source (blue shaded box). 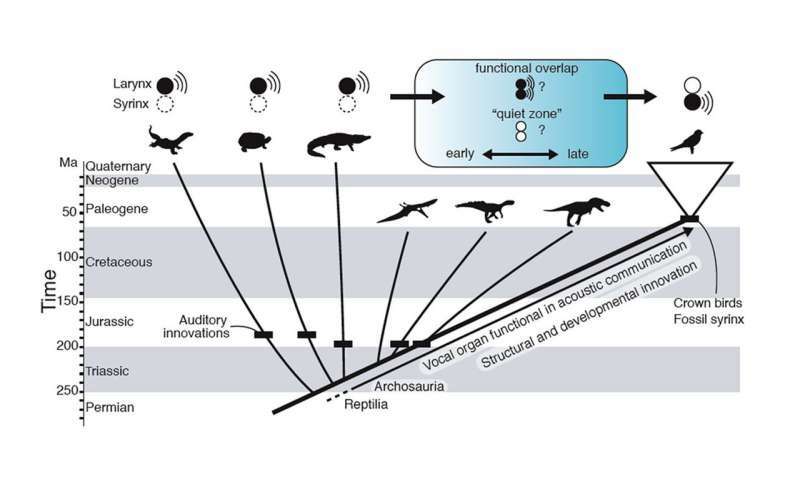 Auditory innovations are shown as black dashes and suggest a sustained role for acoustic communication in archosaurs. Understanding whether the shift to a syringeal sound source occurred early or late in bird-lineage archosaurs will require further comparative genomic and paleontological work. Credit: Julia Clarke et al. Kingsley says he hopes this study will be useful for all scientists studying how new features evolve. "One of the grand challenges in biology is understanding how novel structures arise, why we see weird traits in some organisms," he says. "This study gives us an idea of how one of those novel structures, the syrinx, might have come about." Eliason also notes that the evolution of the syrinx is inextricably linked to the evolution of birdsong, and thus, of birds themselves. "Birdsong is what they use to communicate, to find mates and warn each other of predators. It's because of the syrinx that birds can produce all these different sounds. There are over ten thousand species of birds, each with a different call—their ability to produce all these sounds could have played a role in generating the bird diversity that we see today."